The dust has nearly settled on new German solar photovoltaic (solar PV) tariffs. The new tariffs, new degression schedule, and new limits on generation are all being widely reported in the trade press. I won't go over ground covered more effectively by others. See the links below for more information. What is clear is that Germany's renewable energy policy will be a key issue in the upcoming federal elections. Unlike in North America, the fight will not be about whether to have a renewable energy policy or not. No, that decision has been made. Instead, the fight will be about how fast to develop new renewables, especially solar PV, and who will get to own the generation. The new tariffs in particular penalize homeowners, small businesses, and farmers by limiting the amount of electricity they can sell to the grid. 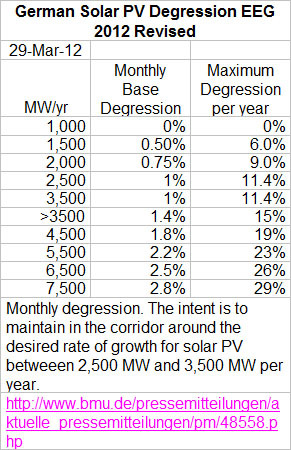 Only 80% of solar PV generation from this tranche qualify for the new tariffs, effectively cutting the tariff even further than the posted price. Large groundmounted systems, in contrast, can sell all their generation at the posted price.